What does it mean that a lesion is sclerotic? Well, generally, it means that it is due to a fairly slow-growing process. Bone reacts to its environment in two ways — either by removing some of itself or by creating more of itself. If the disorder it is reacting to is rapidly progressive, there may only be time for retreat (defense). If the process is slower growing, then the bone may have time to mount an offense and try to form a sclerotic area around the offender. How should one approach sclerotic bone disease? I think that the best way is to start with a good differential diagnosis for sclerotic bones. One can then apply various features of the lesions to this differential, and exclude some things, elevate some things, and downgrade others in the differential. Let’s apply the good old universal differential diagnosis to sclerotic bone lesions. As you can see, by just dropping the items that tend to cause generalized sclerosis, we have generated a fairly good differential for focal lesions. The differential for multifocal lesions happens to be identical to that for focal lesions. You may have been surprised to see metastatic disease listed as a leading cause for diffuse sclerotic bones. It is true that the usual appearance of skeletal metastases is that of focal lesions — diffuse sclerosis occurs in only a small fraction of cases of skeletal metastases. However, cancers that metastasize to bone are very common. The lesson here is that when we are dealing with a very common disorder, even its less common presentations will be seen commonly. There are a number of other helpful findings you can look for that can help you to cone in on or away from specific entities in one of these differential lists. Most cases of chronic osteomyelitis look pretty nonspecific. However, if one sees sinus tracts associated with a sclerotic area, one should strongly consider osteomyelitis. Diffuse skeletal infarcts can be a common cause of diffuse skeletal sclerosis. In fact, in areas where sickle cell disease is common, this may be the leading cause of diffuse sclerotic bones. When you are considering osteonecrosis in your differential diagnosis, look at the joints carefully. 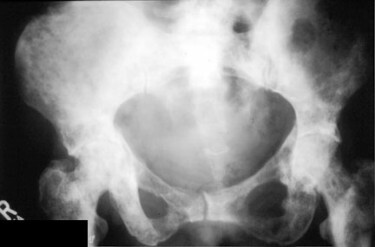 If you can find evidence of subchondral collapse or the typical lucent/sclerotic appearance of the necrotic bone in the weight-bearing bone, then osteonecrosis becomes a much more likely diagnosis. Patients with sclerotic lesions due to metastasis often have a history of prior malignant disease. Ask the patient or the clinician about this. Likewise patients with sclerotic lesions due to various drugs or minerals will tell you what they are taking if you ask them. When considering congenital causes of sclerotic lesions, benign causes such as bone islands or osteopoikilosis usually have a fairly typical appearance and are hard to mistake. Osteopetrosis and pyknodysostosis are likewise hard to mistake for other entities since the bones are denser than in any other disorder, and the long bones tend to have very tiny medullary canals. When considering trauma as a cause for sclerotic lesions, remember to check and see if the areas involved are areas in the typical distribution for stress fractures. When considering hyperparathyroidism, look for evidence of subperiosteal bone resorption. When considering Paget’s disease, it is extremely helpful to note whether there is associated bony enlargement. This is extremely common in Paget’s disease but extremely uncommon with a blastic metastasis. Another finding classic for Paget’s disease is that it almost always starts at one end of a bone and then spreads toward the other end of the bone.